The perception of Toronto by outsiders and those actually living within the city are very different. As someone who moved year a little over a year ago, I can confidently say that Toronto is not the mean, green, and cold place many across Canada think it to be. Toronto is hot, it is fresh, and it has an edge to it that offers people many creative outlets to express themselves. The new video “The Views are Different Here,” released by Tourism Toronto, truly manages to capture Toronto’s essence and shows a variety of different perspectives to living in the Big Smoke. The video is getting massive hits on social media because it shows the quintessential Toronto narrative of a multicultural city, where everyone is welcome. Tourism Toronto manages to capture the annual pride parade, the AGO, Caribana and a Drake concert in the video and it creates a narrative of what it is like to be a part of the multicultural fabric of this city. When I moved to Toronto from Western Canada, I had certain assumptions of the city. I thought it would be big, mean, and greasy. It has the reputation of being the main hub of Canada where people go to work long hours and spend most of their time underground on the subway. I was completely surprised when I learned that Toronto isn’t just a chaotic and busy city, but actually exudes a vibe that is creative and beautiful; yet, authentic. Toronto is replete with people full of large ideas concerning art, the environment, music, and everything in between. Most of these folks manage to own their ideas, but are not pretentious or self-serving about it. In other words, they are real and genuine creators looking to collaborate and work with other like-minded people. Though Toronto typically has a reputation of being one of the more ‘unfriendly’ Canadian cities, its actually just the opposite. The majority of city dwellers are non-judgmental and very kind to each other. I have met so many lovely people since moving here and am struck nearly every day by how kind the average person really is. There is a level of openness and progressive discussion in this city (perhaps due to deep ties leaning to the left politically) that opens doors for a variety of topics. Any daily conversation could range from an 80 year old man about attending a drag show to discussing the future of classical music with a 20 year old woman with green hair. I will even admit that the man bun has grown on me. It isn’t just a sign of the dreaded hipster, but has become a fashion symbol for the Toronto urban style ([note the clip in the tourism video of the older gentleman with the man bun, doesn’t he look suave?). It is important to notice that the video also includes a special focus on graffiti art in the city. To see the beautiful street art that exists in the city showcased as a tourist grab is phenomenal. It is a form of art that deserves celebration and there is a turn happening in Toronto where art is become an important avenue of expression for the city. Lastly, the video also manages to put a creative spin on the TTC with ballet dancers on the subway. This gives a more positive outlook for the subway system, and dare I say it almost makes commuting on public transit look enjoyable. It really is incredible to see Tourism Toronto for giving other outsiders such as myself a more realistic glimpse of what this beautiful city has to offer. I am proud to live in this dirty, artsy, and fascinatingly multicultural city. It is busy, it is loud, and it is in your face. I would ask for nothing else in the years of my youth and I am astounded nearly every day by something new and fresh in this city that I just hadn’t noticed before. What did you think of “The Views are Different here”? Let Women’s Post know in the comments below. 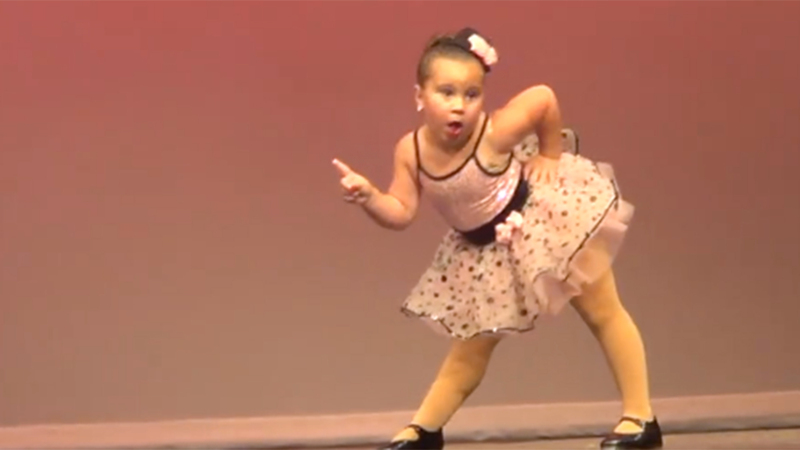 6 year old, Johanna Colon’s, performance to Aretha Franklin’s Respect is putting smiles on millions of faces since her internet debut a couple of days ago. The video went viral immediately. What can we say; her sassy, fierce moves will have Beyoncé shaking in her leotards. Words fail me when I think of ways to describe this. Masterpiece comes to mind. Genius. Art. While this man may not know the joy he has brought to this writer and other viewers of the video, he at least knows that he has a wicked kick and some sick moves. Below are some of my favourie stills from the video. You can follow Travis on Twitter at @TravMyers for all the latest in Backstreet Boys dance videos from over a decade ago.